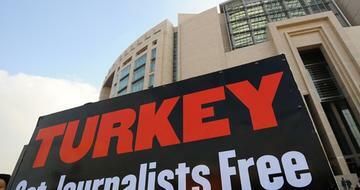 Journalists have been suffering the consequences of reporting on the misdeeds of the Turkish Government. Turkey, with the highest number of journalists in prison, and very high numbers of fatal and non-fatal attacks against independent journalists, has witnessed a steep decline in the level of freedom of the media - from 54 to 65 in Freedom House's Press Freedom Index, which since 2013 rates Turkey as "non free". The latest incident is a new court case against the journalist Tunca Öğreten concerning an interview he had with Perihan Mağden, a prominent Turkish writer, on the topic of the September 2015 confiscation of Nokta Mag, a provocative political magazine that has been closed down and its editors arrested. The crime that Öğreten is accused of is filed under “Insult to the President” cases (art. 301 of the Turkish Penal Code), and the claim arises from Mağden’s statement in the interview that president Erdogan “is behaving like a wild tiger, a wild animal in a corner”. Öğreten writes for the digital platform Diken, which is a young news portal. The Daily Yurt also published the news piece and the president’s lawyers cited news clips from Yurt when they contacted the State Chief Prosecutor in Istanbul. The court has rejected the explanation and a court case has been opened not only for Mağden who uttered the words “wild animal” but also for Öğreten who published them. Journalist Öğreten is facing up to 4 years of prison for this court case; the first trial will take place in Istanbul on 12 May 2016. There are a total of five criminal cases opened against Öğreten: three for “insult to the President”, two for “insult to the Prime Minister” and one for “terrorism propaganda through journalism”.